Amanda Palmer’s project with Jason Webley, Evelyn Evelyn comes to the Showbox Market this Wednesday, May 19th. 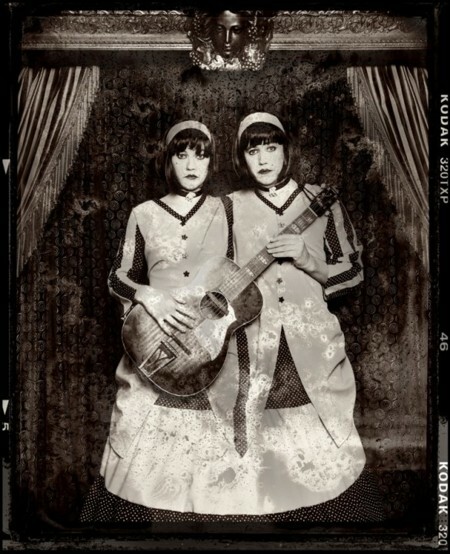 The duo performs as conjoined twins, Lyn and Eva Neville. Evelyn Evelyn’s debut album just came out in March – look forward to their cover of Joy Division’s Love Will Tear Us Apart. 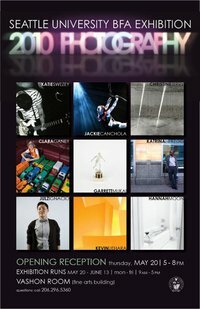 On Thursday, May 20th, Back Beat Seattle photographer Jackie Canchola and local music photographer Katie Swezey celebrate the completion of their BFAs in Photography with an exhibit at Seattle University. Congratulations you two! In ‘Bending Intimacy,’ Jackie Canchola interacts with a thriving and flourishing city of drag, burlesque, circus, and cabaret. Canchola features numerous Seattle performers such as The Shanghai Pearl and Sylvia O’Stayformore and creates a series of transition triptychs from an everyday person to their larger-than-life stage persona. I’ve been captured by the larger-than-life personalities that grace the stages of Seattle. These performers delight our senses with whimsical acts of pure, radiant energy. The makeup is luminous, the costumes are loud, and the passion is real. These creative and bold performers are, surprisingly, everyday folks. I feel honored to have witnessed to their transformation, sometimes minutes before they hit the stage. Each home and dressing room is full of glitter, tools, and an endless flow of extraordinary inventions. The spirit of live theater thrives and flourishes in this breathtaking community of visual sensations. Katie Swezey’s life-long love affair with music has permeated her photographic work. She has been documenting the vibrant Seattle music scene with passion and panache, and in the show ‘This Side of Sound’ presents her images in a classic fine art style – using a 35mm camera and black and white film, her photos capture the raw energy of the live music experience. She adds a personal and artistic element to the work through the use of hand-coloring techniques, inviting the viewer into her addictive world: sometimes dark and melodic, sometimes fast and loud. Seattle University is located at 901 12th Avenue in Seattle. Exhibit is in the Vashon Room. For more information call 206 296 3360. Written by: Dagmar on 05/17/2010. This entry was tagged evelyn evelyn, jackie canchola, katie swezey, posted by dagmar. Bookmark the permalink.